so why is this news Linda! who cares abi make I dash you my damatol,MERCY? People were actually right when they said she had danddruff, craw craw, lapalapa etc when Linda posted her bald headed picture. Nollywood and lack of professionalism. Only God knows the peanut she was paid and the agony she went through after. But one thing I like about her is that she did not regret her action. How will she regret it after earning 5 million Nairas for it ?? she didn't have much hair to begin with anyway! Linda, is it by force to post on this chick? who cares what she had on her head. abeg, enough with this chick. She was bald in the first place, under those hideous wigs. She needs more people. Shave or no shave, the movie will be a waste of time. She was already suffering from every hair problem due to her insane love for lack of proper hair care practices you could think of: alopecia, breakage, overprocessed hair, dandruff, overly burnt scalp due to wrong application of relaxers by the whack hair professionals we have in nigeria. To be honest she needed a fresh start. By the way copying edith jane azu-ayalogu in cutting her hair doesn't mean professionalism. 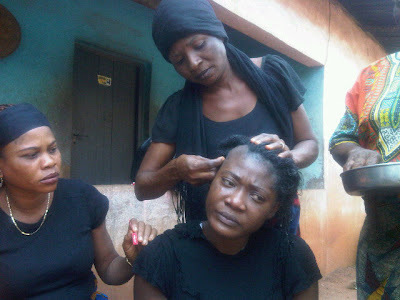 Since that woman cut off her beautiful long hair, together with bimbo akintola every ada, bola and aisha in nollywood has been following suit. i'm sure she didnt ask linda to post this..
i also think the cutting with razor might have been a scene in the movie depicting how widows heads are shaved in the villages..she has not said she's a better actress because she shaved her head..
also, its her hair...she can do what she likes with it...u dont have to see the movie..maybe u arent even part of the target audience..
i think the attack on Mercy is really unnecessary..give it a rest already..peeps! If you guys do not have anything good to say about anyone, don't say anything at all. She was simply gisting a reporter and it got on here. Abi she should lie that shaving her hair and all that was exiting and pretend to be a super actress. Professionalism is doing what it takes to achieve the desired purpose and that what she did. You guys should stop hating and appreciate hard and good work. No news. By the way, what should they have used to shave her hair in a village setting? A clipper? I bet she earned her worth from the role, so no complaints.